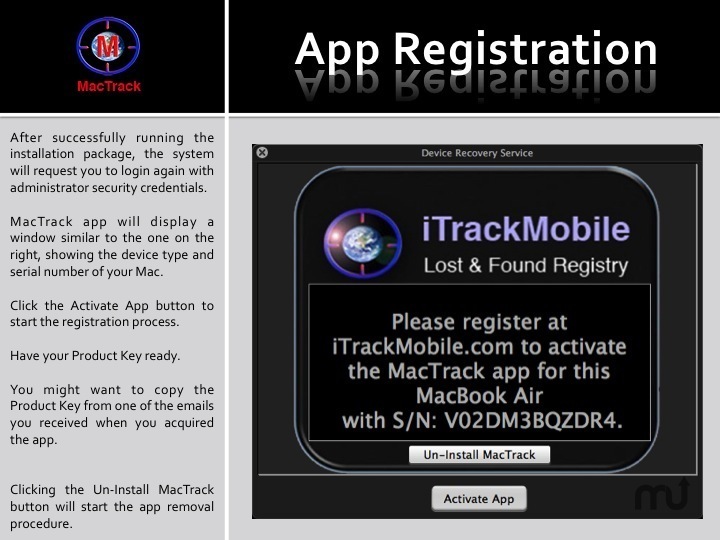 Track and recover your lost Mac. Is there a better alternative to MacTrack? Is MacTrack really the best app in Security category? Will MacTrack work good on macOS 10.13.4? Provides a standard wallpaper ID image for prominent display on the device Desktop screen to assist in the recovery of a lost unit. Displays customizable alert messages on the device screen in the event a member declares a device as 'lost'. 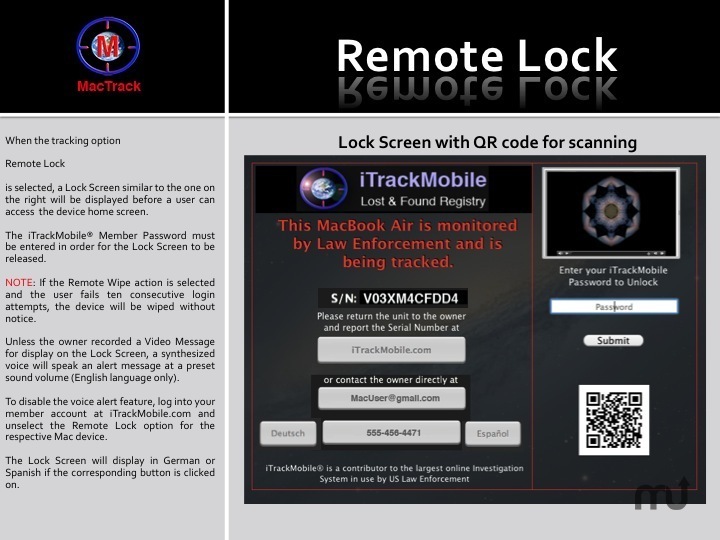 These messages can be displayed to offer the finder more comprehensive options to return the device to the owner. 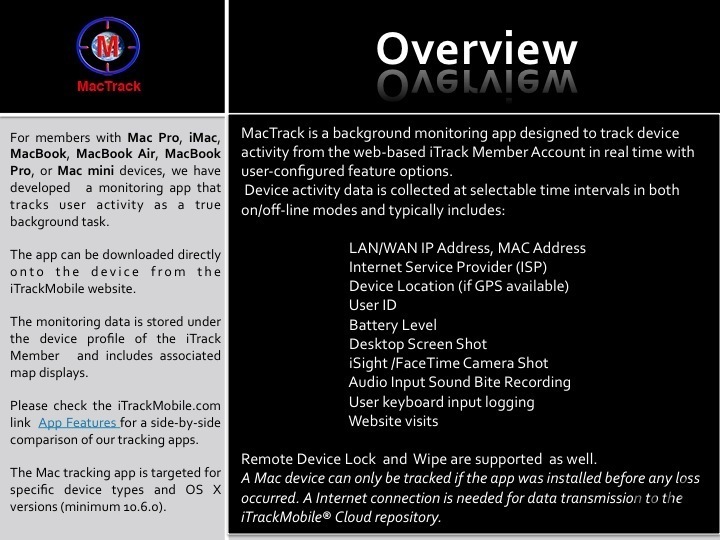 MacTrack needs a review. Be the first to review this app and get the discussion started! MacTrack needs a rating. Be the first to rate this app and get the discussion started! Performs tracking functions while the app is running in background at user-selectable time intervals. Captures tracking information by Internet IP addresses (both LAN and WAN), as well as device location services. This information can be useful to supplement a police report in an effort to recover a device that was reported lost or stolen. Identifies the Internet Service Provicer (ISP). Monitors and records the device battery power. Can take snapshots using the device iSight or FaceTime camera, the desktop screen, keyboard input strokes, and sound bite recordings from the default microphone. Features multiple remote device-wipe options. Remote Lock prevents access to the device Desktop. Records the UserID under which the device operates. Has a DIY label-printing feature for attaching to the outside of the device case. In case of theft, owner has the option to have device-tracking information automatically interfaced with the largest online investigation system in use by U.S. law enforcement. This feature is provided free of charge. All device activity is filed at the Lost and Found Registry for each device. When a device is lost, an alert screen is displayed to enable the finder to contact the owner for the return of the unit. The customizable alert text can be remotely activated to speak in a synthesized voice (English only). 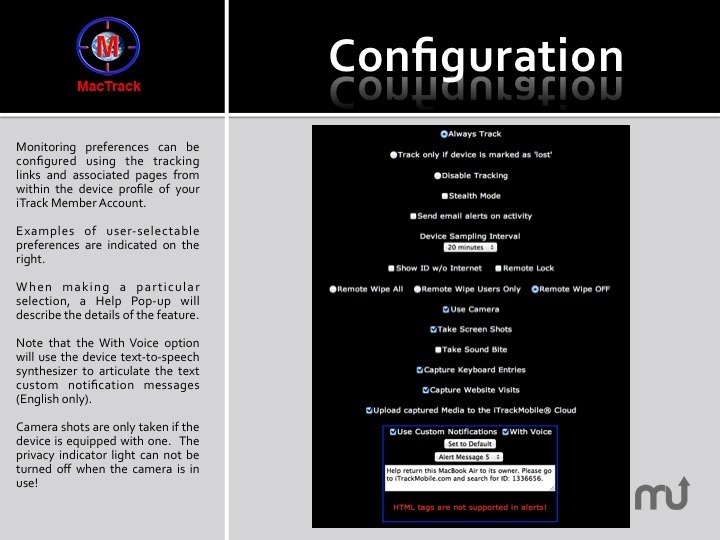 Many user-customizable tracking options are available. 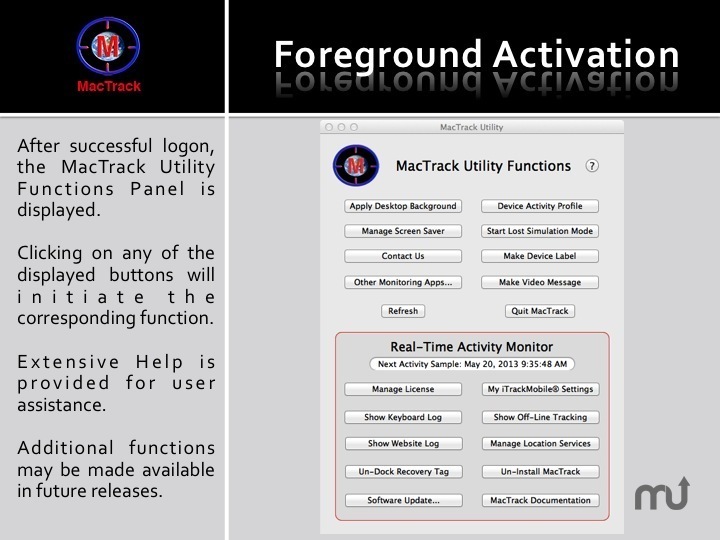 To run the MacTrack app, your 14-day-trial product key will be dynamically assigned during the installation procedure. Upgrade to a perpetual license at any time.